Adapting high-tech methods,this product can give out super-low Electro-Magnetic wave and ultrasonic wave at the same time which can stimulate the nervous and hearing system of the mouse,make them uncomfortable and unpleasant and drive them away.The frequency of the above-mentioned electronic wave are always changing and intermittently,which can not make the mouse have any “Adaptability”and Immunity”. The product doesn’t use any chemical medicament,no mist,no smell,no any pollution for environment,no any harm to the human body and pets,which can widely used in family,office,warehouse,hospital,super-market,hotel,machine-room,etc.Its effective area can cover around 30-50 square meter. 2.AC 220V/.50Hz power system must be confirmed before using it. 3.It should be used continuously without stopping. 4.It should be installed as low as possible from the ground because most of the mice running on the ground. 5.The effects will been seen immediately as soon as it used.But the best effects will be reached after using it continuously for 3-4 weeks.Sometimes the mice may be more active at the beginning which shows the mice have benn irritated.Then the mice will disappear after a period. Even few of mice remain temporarily,they will lost their ability of reproductions and invasions. 6. There are should be no big obstructs in the front of the product because ultrasonic wave can not pass through the hard things. 2. Each week change the frequency from low to high, the pests can not get used to the sounds. 3. Pushing down the testing ,then a kind of piercing sound will be heard which indicates the ultrasonic wave is normally working. 4.Without the power line and after fully charged,turn on the switch,the device will begin to work. 5.When charge the device,should turn on the switch,then the indicator will be two color led lighting.It need to charge 12 to 15 hours. 6.Charge the device 12 to 15 hours before use. 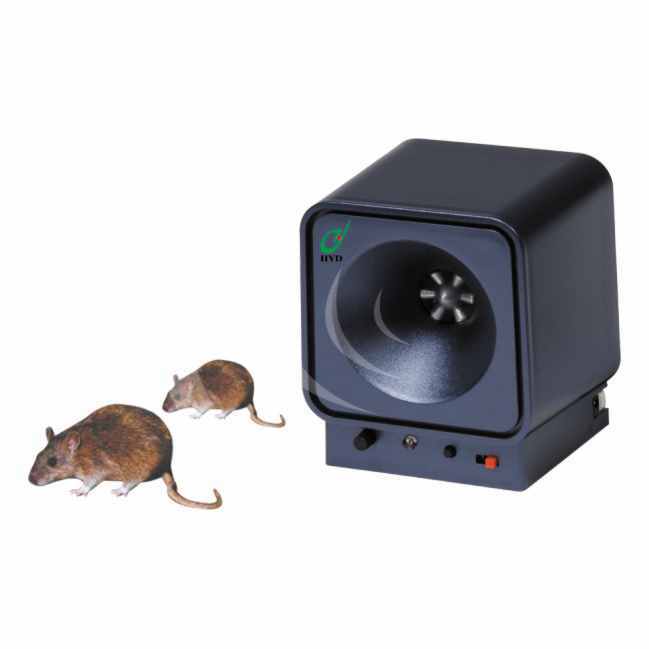 A special research has been made by American experts,the conclusion is: there is a certain “carrying capacity” for a certain space.If one mouse killed,another new one will be borne or coming.So mouse can be never killed over.If we use our pest expeller to worsen the living environment of the pests and lower “carrying capacity”,no new mouse will be borne or coming.That is to say, "killing" will speed us the repeodictions of the pests and "expelleing" will restrain the reproductions of the pests.So “expelleing” is more positive than “ killing”.So do the other pests. 1..For the pests,the ability of reproduction and living is astonishing.They will have "adaptability" and "immunity" to the pesticide after the fourth generations.So it is impossible to kill all the pests using pesticide.Furthermore,the pest corpses will be easily eaten by the pets also make enviornment pollution and spread virus.More seriously,the pesticide can be mistakenly eaten by the children to affect their health even to be killed. 2.Because changable frequency,It can not make the pest to have any "adaptability" and "immunity". 3.You have to repeat buying if using pesticide.But once you buy our pest expeeler,you will get benefits for more than 5 years.